I've been inspired by a lot of fan art lately. Here is my take on Tinker Bell and Peter Pan. The story of Neverland always changes based on the author. In my story, Captain Hook mysteriously disappears. We would normally think of this as a good thing. However, Hook represents balance. With him gone, there is an unexpected power shift in Neverland which threatens all of the people in it. To put it simply, Neverland needs Hook. So who will pick up where Hook left off? Done with Procreate on iPad Pro. I decided to do a new self portrait for my contact page. There's not a whole lot to say about this one. Sketch, ink, then color. It was fun. Before, I was using 3-4 different pieces of software to get the look/effect that I wanted. Now, my entire illustration process has been consolidated to one place. This was done with an iPad Pro, Apple Pencil and the Procreate App. This was the final piece I did for inktober and the Leopard vs Cheetah duel with my friend. I've always loved a good fight scene. Most fight scenes start with a great establishing shot. I wanted to make this one look like an action camera shot, and something that had a bit of narrative. As I grow, I'd like for most of my work to tell a story with one image. This character is Zinnia of the Cheetah Clan. This time, I decided to do a traditional piece for inktober. The folds in the clothing were the most challenging. It's best not to guess on stuff like that. Reference is a must. At some point, I'll redraw this in the Procreate app and add some color. This is more of the Cheetah Clan sketches for inktober. I named him Kembe to keep the creative juices flowing. I found that making a name or short bio helps me with the design. I pictured him as a philosopher, and trainer for the group. I'm really intrigued by Zulu and Maasai culture and clothing. Some of those design elements find their way into my characters. I have never taken part of Inktober, so I felt like this year was as good a time as any to start. As I began sketching, I got stuck on these cheetah characters and named them the Cheetah Clan. I was inspired by the concept and it really helped me to draw more durning the month of October. A friend of mine joined the fun by creating his Leopard Clan as competition. Technically, all this would be "digital" inktober, but if it brings people together, who cares if the finished piece is digital or not? Check out the rough sketch and finished lines below. This was done on iPad Pro using the Procreate app. Here are the early sketches that I did for my Mermaid character design. I went through quite a few concepts with the shape of her upper and lower body. I even thought about making her more creature-like. You can see some of that in the face, but the rest is definitely more human. All of these were done using the iPad Pro. I was very impressed with how the lines looked and how the Apple Pencil felt in my hand. I'm even able to put together these sketch pages a lot faster. This is my submimsion for the Character Design Challenge for May. The theme was Mermaids & Mermen. This young mermaid came across a little trouble as she explored a dark trench. My usual process starts with a paper sketch. Then I scan it and add color in Illustrator or Photoshop. However, this illustration was all digital. I did this entirely with an iPad Pro and Apple Pencil. I used an app called Procreate. I can't say enough good things about it. I learned that it is possible to do finished work on an iPad Pro. This new tool has eliminated a few steps and increased my speed. Here are the early sketches for Guardian Link. As you can see, most of my early sketches were female. As I did more research on the cultures I wanted to include, I changed my mind and made him male. Some of these would have worked just as well as the final. Here is another illustration I did for the Character Design Challenge. This particular challenge was to design any character from The Legend of Zelda. I chose to do a complete reimagining of Link. I wanted to avoid doing a simple race swap. People tend to get really weird about that. So I came up with a backstory. This story does not exist in Hyrule. It takes place in a hidden land to the far north. The Tri-Force was born there. An ancient race called the Guardians swore an oath to protect it. This gave birth to Guardian Link. I took reference from the Maasai and Mursi people in Africa. Here are some early sketches of Viktopus. Lots of ideas rolled around my head before I decided on a final design. I received a great critique from a good friend and learned that some of the features needed to look more like an octopus. That prompted me to do more with the shape of his head and arms. There is more to anthropomorphism than simply putting an animal head on a human body. Certain features have to be recognizable in order to get the desired effect. This is a piece I did for the Character Design Challenge on Facebook. This month's theme was to create a Viking. Sounded simple enough. I wanted to think a little differently, so I decided to go anthropomorphic on this one. The first thing that came to my mind was an octopus. I did other sketches, but the octopus stuck with me. One of my favorite villains of all time is General Grievous. In the 2D animated Clone Wars, I loved how he made use of all his limbs. I see a little of that in this character. I imagine him being able to block and strike at the same time. His name is Viktopus. He swore an oath to protect his home from the invaders... the human vikings! Here are some random sketches of scarecrows that I did. The challenge was to add some personality to something that doesn't have a human face. As I did more sketches, I remembered the purpose of a scarecrow. Scarecrows keep the crows away from the crops. Sounds like an ongoing war to me. That is a simple enough story to draw inspiration from. In a separate series, I will explore things from the crow's point of view. This might turn into something special. It's been a little while since my last post. I have made a lot of sketches that I have not yet uploaded. I'd better get on that. This is a young martial arts master with a three-section staff. I'm not sure what type of creature he is. He could have been casted for Monsters, Inc. I used a reference pose for the initial sketch, then turned it into vector art in Illustrator. That seems to be my method of choice until I get more practice painting (and until I get my hands on that iPad Pro). This looks like a character that would work well in Toon Boom. I haven't had the chance to get down and dirty with Toom Boom yet, but it will happen soon. Here is a sketch of a drummer girl. I started with a reference pose, and added a few elements, namely the drumsticks, to make her unique. Normally, I would take a sketch into Illustrator and make it vector art. This time, I decided to paint it in Photoshop. That was a bit of a challenge. I am so used to working in Illustrator that I really had to change the way I add color. With vector art, I can drop color and change it by simply selecting the fill. When trying to paint, I have to consider blending and making it look smooth. That will take a lot more practice on my part because a painterly style will change the tone of the sketch. I normally don't do color sketches, which is probably why I had some challenges. I'll just have to post this sketch with love. 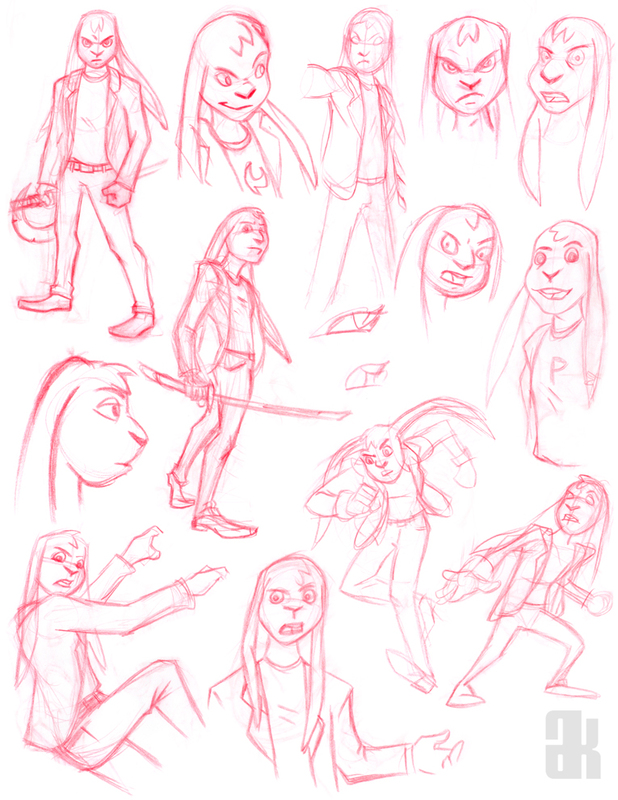 Here are some concept sketches for Phat Rabbit. I went through quite a few poses before I found one I was satisfied with. 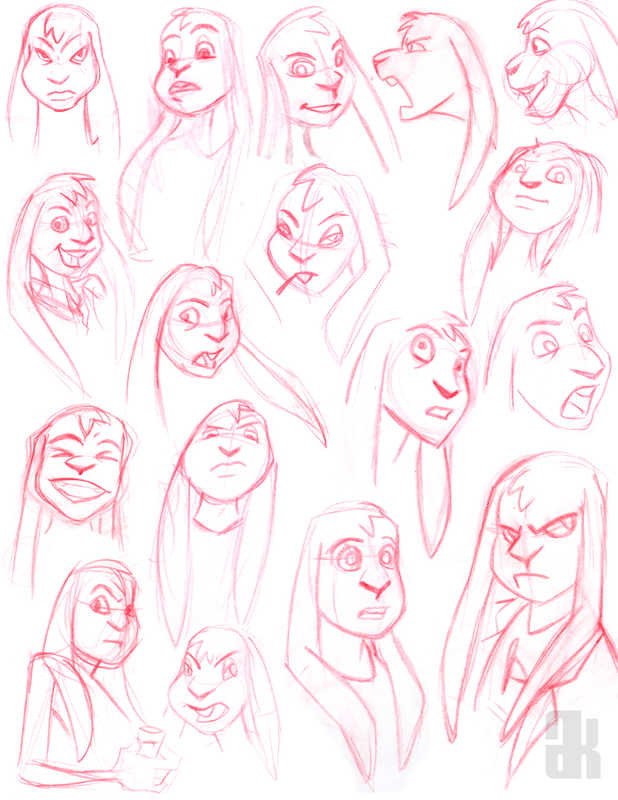 I also did a lot of head sketches to figure out what sort of personality the character would have. I didn't have a lot of details, so I just thought of him as an urban action hero. This is a piece I did for an old friend of mine. I turned a few friends into super heroes, but somehow, I forgot about him. Well, at long last, here is his character. 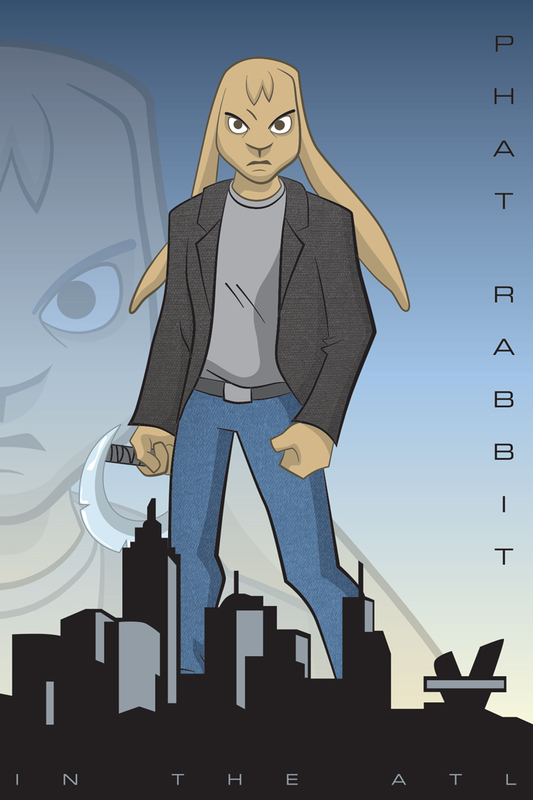 Presenting... Phat Rabbit. It's the near future. When the sovereign nations of the world went bankrupt, the smaller nations suffered the greatest. Conflicts over land and resources erupted everywhere. Only the most persuasive of people can bring light in the midst of darkness. This ray of light is called The Peacemaker. This series of sketches show a sports theme. A good way to come up with a dynamic pose is to think of something dynamic. The easiest way for me is to think of sports. I can remember collecting TOPPS and UPPER DECK trading cards for my favorite sports teams. They set the ground work for great imagery. Now I look there to draw inspiration for a good page.